Iris in many classes can show a beautiful purple staining at the base of their foliage. In cool sunny Spring climates this may extend far up the leaves and sometimes the entire plant may be purple. Many have admired tis trait and tried to enhance it with breeding but result still seem somewhat limited. Certainly a purple foliaged plant would make a great novelty iris. Most groups show this trait in some members. In the beardless irises this seems to be a possible indicator to separate Iris virginica from its hybrid with Iris versicolor known as Iris Xrobusta. In cool climate countries such as Germany Iris robusta plants may be wholly purple in spring. 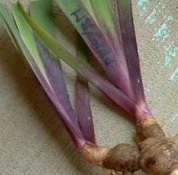 A totally purple bearded iris has yet to be recorded but the blue anthocyanin sugars have been known to color stalks and/or spathes in some plants. The American Dykes Medal 1940 winner Wabash' can be distinguished from the similar 'Bright Hour' because 'Wabash' has purple based foliage. The Spring 1992 issue of ROOTS has an article and list of purple based foliage irises through 1939 introductions. You can find this article "I.D. Groundwork" by Phil Edinger online at: http://www.worldiris.com/public_html/Frame_pages/Purple.html Note that the previous link no longer works; however you can see it via the Wayback Machine at: http://web.archive.org/web/20140826201903/http://www.worldiris.com/public_html/Frame_pages/Purple.html (which is the most recent snapshot, earlier ones are also available). It also is now available on the HIPS website at: http://www.historiciris.org/articles/id-groundwork-pbf.html as reference material for a new effort to collect purple based foliage information for identification of irises. More information and how to participate at: http://www.historiciris.org/hips-pbf-study/. We are developing a list below of Irises with this trait. Please add any that have been missed by commenting in the comment box. Arilbred: 'Alakazam, 'Anacrusis', 'De Nile', 'Enchanter's Spell'., 'Firefly Frenzy'. Border Bearded: 'Dark Wonder', 'Elegant Lass', 'Haunted','Pitoune', 'Tina Louise', 'Tink', 'Whoop Em Up'. Intermediate Bearded: 'Andi', 'Arctic Fancy', 'Devilish Nature', 'Eclaircie', 'Hand Sewn', 'Jump Start', 'Lapwing', 'Pink Kitten'. Miniature Dwarf Bearded: 'Red Pixie'. Miniature Tall Bearded: 'Alately', 'Bella Vee', 'Blue Express', 'Carla Beth', 'Chickee', 'Cookie's Bright Spot', 'Dainty Cloud', 'Enriched', 'Florence French', 'Frilly Milly', 'Lively Rose', 'Ozark Sky', 'Slim Jim', 'Smarty Pants', 'Snickerdoodle', 'Sport Coat', 'Zula'. Siberian: 'Pretty Polly', 'Reprise', 'Sound And Spirit', 'Strawberry Fair'. Species Hybrid: 'Fairyland', 'Robusta', 'Wild Petticoats'. Standard Dwarf Bearded: 'Candy Queen', 'Cat's Eye', 'Cherry Cola', 'Chum', -'French Toast', 'Harlem Nocturne', 'Last Hero', 'Serendipity Elf', 'Sun Doll'. Tall Bearded: A-E: 'Abdera', 'Acoma', 'Alta California', 'Ambassadeur', 'American Original', 'Amethyst Flame', 'Amy Veronica', 'Angels In The Architecture', 'Apple Capital', 'Argus Pheasant', 'Art Deco', 'Artist's Dream', 'Auburn Star'. 'Aurora Lights', 'Balmung', 'Bandera Waltz', 'Bayberry Candle', 'Betty Simon', 'Big Hat No Cows', 'Big Spender', 'Blue-Eyed Baby', 'Blue Shimmer', 'Blue Trill', 'Brass Lamp', 'Brigadoon', 'Bronze Beauty', 'Burning Coals', 'Buttercup Bower', 'By Design', 'Cajun Cooking', 'Calgary', 'Caliente', 'Carnival In Rio', 'Carnival Ride', 'Caroline Jane', 'Catch The Fever', 'Caveman', 'Chancel Choir', 'Chinook Winds', 'Cinnamon Bells', 'Circus Circus', 'Classic Look', 'Clear Choice', 'Commentary', 'Congo Sunset', 'Corn Dance', 'Cornhusker', 'Coronation', 'Crystal Blue', 'Dark Storm', 'Deep Black', 'Designing Woman', 'Distant Roads', 'Divine Light', 'Downtown Man', 'Duplication', 'Elsa Sass', 'Escartefigue', 'Evergreen', 'Everything Plus'. F-J: 'Fabulous One', 'Falcon Pride', 'Fancy Friends', 'Fill Up My Senses', 'Five Star Admiral', 'Flaming Heart', 'Flauntress', 'Florence Nightingale', 'Florentine Silk', 'Fluent Mandarin', 'Gala Madrid', 'Game Plan', 'Gentle Rain', 'Ghost', 'Grand Canyon', 'Grand Waltz', 'Grapetizer', 'Greta', 'Gypsy Glitter', 'Gypsy Skirt', 'Happenstance', 'Happy Hugs', 'Harvest Of Memopries', 'Heart Of Glass', 'Honky Tonk Blues', 'Hoo Doo', 'Instructor', 'Invitation Only', 'Jacques Offenbach', 'Judy Mogil'. K-O: 'Kenzi's Hope', 'Laced Cotton', 'Lady Jan', 'Laura Beulow', 'Lucky Doris', Magenta Midnight', 'Majestic Swan', 'Magnificent Masterpiece', 'Mani Pulite', 'Marie Claire', 'Mark 1', 'Mary Geddes', 'Midnight Cowboy', 'Midnight Romance', 'Mississippi Blues', 'Mystic Image', 'Mystic Jewel', 'Mythology', 'Nights Of Gladness', 'On The Brink', 'One Desire', 'One Step Beyond', 'Out Of Trouble', 'Ovation'. P-T: 'People Of Hex', 'Pink 'N' Blue', 'Pizzicato', 'Points North', 'Pop O'Sha', 'Presumption', 'Purple Pomp', 'Quite Content', 'Rain Forest', 'Red Headed Shirley', 'Ribbon Round', 'Ride The Wind', 'Roll The Dice', 'Ruth Walker', 'Scent From Heaven', 'Secret Service', 'Serena Louisa', 'Serene Lady', 'Shadow Dancing', 'Shadows Of Night', 'Showcase', 'Silver Skates', 'Sky Echo Too', 'Snow Goddess', 'Sordid Lives', 'Spatzel', 'Spell Fire', 'Spider Crab', 'Spinning Wheel', 'Spring Madness', 'Star Trek', 'Sub Zero', 'Sugar Street', 'Summer Whitewings', 'Take Me Away', Tall Dark Stranger', 'The Black Douglas', 'The King Is Coming', 'Thornbird', 'Today's Special', 'Tomcat', 'Trapel', 'Trebba', 'True Spirit', 'Tudor England'. U-Z: 'Under My Spell', 'Villain', 'Wabash', 'Waffle Talk', 'Walking On Air', 'Waves Of Joy', 'Wishing Hour', 'Zurich'.